Oh, happy day. Well, more than a day … happy season. The time for grilling is upon us, and I, for one, could not be happier. There’s just something completely awesome about grilling. Meals get simpler, the kitchen stays cleaner, the sun shines down on you, and it’s just darn impossible not to smile. And contrary to sometimes-popular belief, there are loads of delicious grilling options for vegetarians! Yep. It’s a good time of year. When the weather officially warms, one of the first things I love to throw on the barbecue is artichokes. They’re the perfect warm-up to the glorious grilling season that lies ahead. While I’m a fan of all sorts of dipping sauces for artichokes, I realized recently that I was a little short on butter-less or mayo-less options. So I thought I’d develop a healthy-fat-based dipping sauce instead–and it just happens to be vegan, too! The sauce (really more of a flavored olive oil), is very simple. 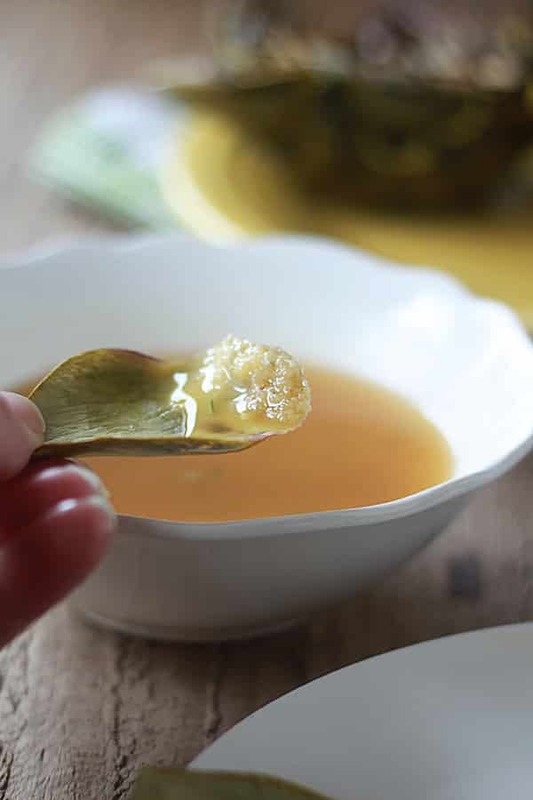 First, you make rosemary-infused olive oil (so, so easy), then you blend that with sweet roasted garlic, a bit of Dijon mustard, a light squeeze of lemon juice, and a bit of kosher salt. The result is a wonderful, garlicky dip that’s, actually, surprisingly reminiscent of butter. The bits of roasted garlic tend to sink to the bottom, so every once in awhile, you have to give the dip a stir with a leaf you’re dipping in there. Which means you might end up with a lot of the dipping oil on that particular piece. Grilled artichokes take a little more effort than just plain steamed, but it’s so worth it. You still have to steam them first, but then you cut them in half, scrape out the fuzz, brush on some oil (this recipe makes use of some of the leftover rosemary olive oil for brushing), sprinkle with a bit of salt, and then grill. A few extra steps, but doable, right? The result is a party-worthy, incredible-looking appetizer or side dish that’s infused with that wonderful smoky flavor that grills magically impart. Another thing that’s nice about serving these to a crowd is the option to steam them a few hours beforehand, then put them in the fridge until grilling time. Ahhh. Hello, grilling season! It’s so, so nice to see you once again. Roasted garlic and rosemary make these grilled artichokes shine. Bonus: No butter in sight! These artichokes and their dipping oil are double vegan all the way. Prepare and steam the artichokes. Use kitchen scissors to snip off the tips of the leaves, and then cut off the stem and about 1/2 inch of the top with a sharp knife. Rinse well under cold water. Place the artichokes in a large pot filled with two inches water. Add the lemon slice and bay leaf. Bring to a boil over high heat, then reduce to a simmer and cover, continuing to boil until tender, 30-40 minutes. Remove from water and set aside to cool. While the artichokes are steaming, make the rosemary olive oil and roast the garlic. To make the rosemary olive oil, pour the oil into a small saucepan set over medium heat. Add the rosemary sprigs. Bring just to a boil, then remove from heat. Let sit for 5 minutes. Remove the rosemary and discard it. To roasted the garlic cloves, preheat the oven to 375º F. Place the unpeeled cloves in a shallow baking pan or pie dish and drizzle with 1 teaspoon of olive oil. Toss to coat and cover pan with foil. Bake for 20-25 minutes, until garlic is soft. Remove from oven and let cool enough to handle. Make the dipping sauce. Squeeze the roasted garlic into the bowl of a food processor and discard the garlic skins. Add 1/2 cup rosemary olive oil, lemon juice, Dijon mustard, and salt. Blend until pureed, about 30 seconds. Pour into a small serving bowl and set aside. To grill the artichokes, preheat grill to approximately 500ºF. 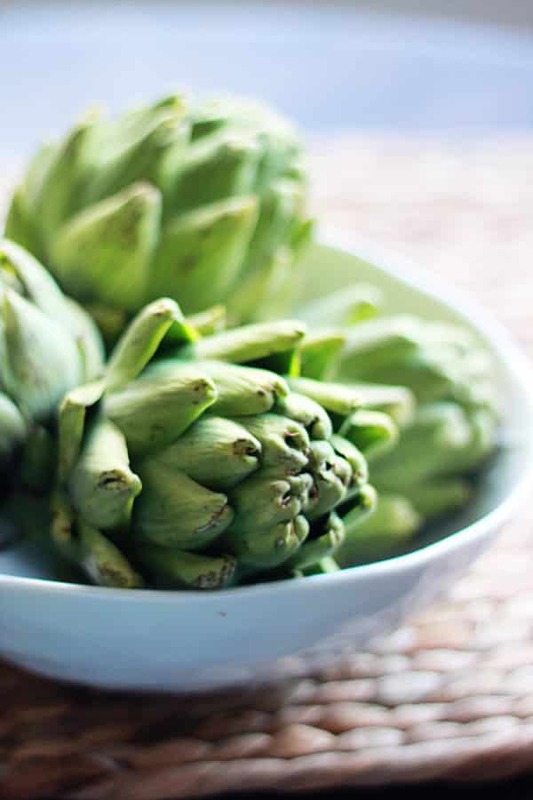 Using a sharp knife, cut the artichokes in half. With a spoon, scrape out just the fuzzy, hairy center of the artichoke, leaving the leaves and heart. Brush well with some of the remaining rosemary olive oil. Place cut-side down on the grill and cook until the artichokes darken with grill lines, about 3 minutes. Use tongs to rotate a quarter turn; cook for another minute or two. Remove from heat and allow to cool for 2-3 minutes. Serve with dipping oil. 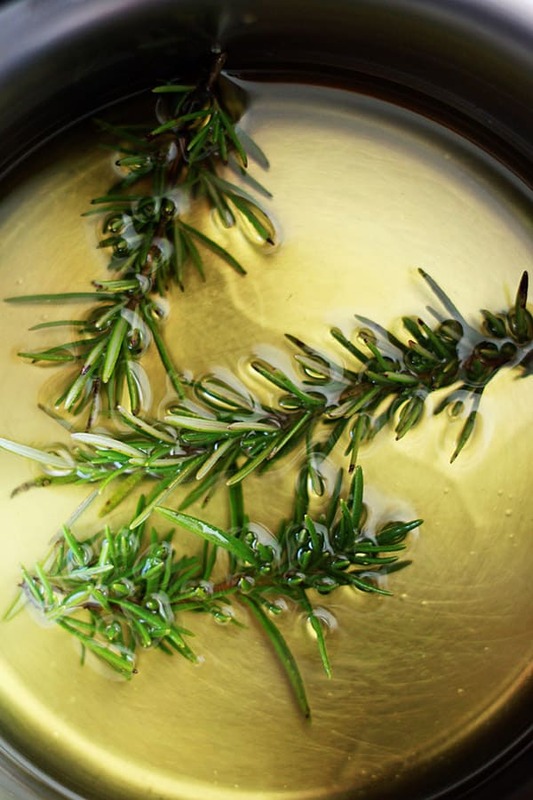 If you have leftover rosemary oil, it’s perfect for dipping crusty bread or tossing with pasta and roasted vegetables. I love steamed artichokes, but have never tried to grill them. These will definitely be added to my BBQ repertoire! What I love best about grilling them (other than the flavor and the fancy grill marks!) is that they are perfect for entertaining. Just steam earlier in the day then slap ’em on the BBQ come dinner time. So easy! I’ve always wanted to try artichokes, but have always been totally intimidated by the preparation. This recipe got my mouth watering, but I was hoping for step by step photos. These look delicious! Especially with a lot of garlic on that leaf! Yum! And SO healthy! Definitely want to make these! Grilled artichokes are an absolute favorite of mine! And this dipping sauce sounds fabulous! 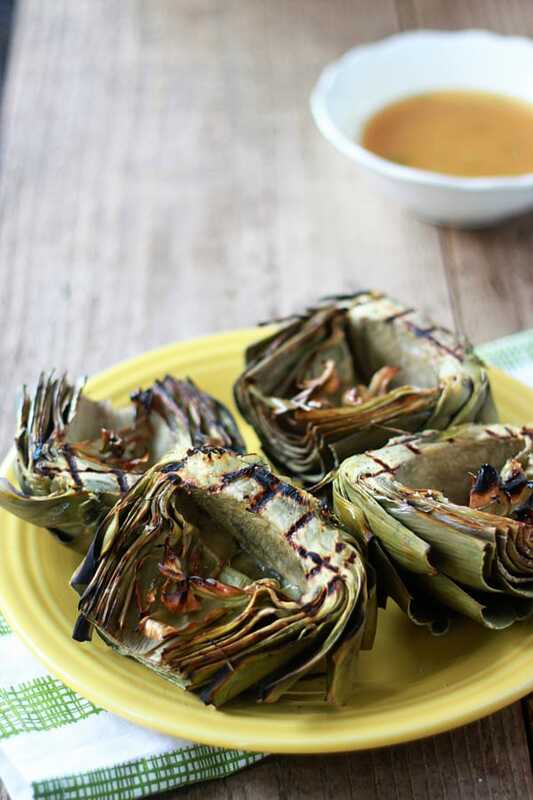 Ok, WOW, these look SOOOO good, love that the artichokes are grilled-what a great idea, definitely going to try this when we start grilling. I’ve been eyeing the artichokes at the store for a while now, but I’ve always been really intimidated about actually buying them and cooking with them. Maybe I’ll make tackling the artichoke my weekend project! We have been having temps in the 90s for a few weeks now, so it is definitely grill weather here! Thank you for the great dipping recipe. My family loves artichokes, but I don’t like dipping my food in butter. I didn’t like conventional butter before I went vegan, and I don’t like vegan butter now. It’s too rich and I feel like it masks the flavor of the artichoke. However, I do love olive oil, so I will try this. Another thing that I found is amazing with olive oil is popcorn. When I used to eat it with butter I always got a stomach ache, and I thought it was because of the corn. Then I started putting rosemary infused olive oil on it when I went vegan, and surprise, no more tummy aches. And, it tastes so decadent. Made these grilled arti’s last night! Terrific and we LOVED the olive oil dipping sauce. Easy recipe and so, so good. Thanks! Holey socks that looks AWESOME! I <3 artichokes and <3 rosemary scented oil even more! I am super excited to make some with rosemary! I just brought my rosemary plant inside because it is going to snow tonight (grrrrrrr! ), so I’ll have it within arm’s reach. I love the idea of drizzling the leftover olive oil onto popcorn. That is something that I enjoy about four times a week! Grilled artichokes are super easy and so good! Thanks for reminding me to make some! It’s at times like these I really wish I didn’t live in Manhattan so that I could have a grill! Do you suppose roasting would have a similarly delicious effect on these ‘chokes? !